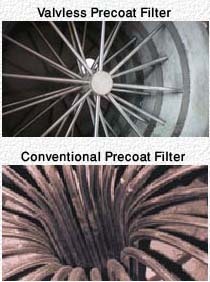 The Rotary Drum Precoat Filter is used to polish solutions having traces of contaminating insolubles. To polish the solution the drum deck is precoated with a medium of a known permeability and particle size that retains the fines and produces a clear filtrate. Diatomaceous Earth (or Diatomite) consisting of silicaceous skeletal remains of tiny aquatic unicellular plants. Cellulose consisting of fibrous light weight and ash less paper like medium. Special ground wood is becoming popular in recent years since it is combustible and reduces the high cost of disposal. There are nowadays manufacturers that grind, wash and classify special timber to permeabilities which can suit a wide range of applications. These materials when related to precoating are wrongly called filter-aids since they do not aid filtration but serve as a filter medium in an analogy to the filter cloth on a conventional drum filter. The scraper blade on conventional drum filters is stationary and serves mainly to deflect the cake while it is back-blown at the point of discharge. The scraper on a precoat filter, which is also called "Doctor Blade", moves slowly towards the drum and shaves-off the blinding layer of the contaminants together with a thin layer of the precoating material. This movement exposes continuously a fresh layer of the precoat surface so that when the drum submerges into the tank it is ready to polish the solution. The blade movement mechanism is equipped with a precision drive having an adjustable advance rate of 2-10 mm/hr. The selected rate is determined by the penetration of fines into the precoat bed which, in turn, depends on the permeability of the filter aid. Once the entire precoat is consumed the blade retracts at a fast rate so that the filter is ready for a new precoating cycle. A conventional valve that is piped, including its blow-back section, to be open to vacuum during polishing. When the precoat is consumed its blow-back section is turned on to remove the remaining precoat heel over the doctor blade. A valveless design in which there is no bridge setting and the sealing between the rotating drum and the stationary outlet is by circumferential "o" rings rather than by a face seal used on conventional valves. The clearance between the drum deck and the agitator on conventional drum filters is sufficient to accommodate cakes of up to about 50 mm while on modern precoat filters higher clearances to allow the formation of 150 mm precoats are quite common. 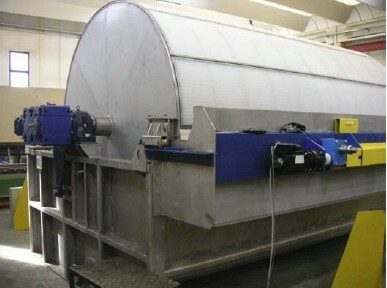 The drum deck is divided into separately isolated compartments each subjected to vacuum while the drum is in rotation. The compartments are divided with grooved division strips along the drum face and around the circumference of the drum heads. The grids cover the entire drum surface and serve to support the filter cloth. The filter cloth itself is fastened to the drum by inserting special caulking ropes into the grooves. Since the water flow during precoating is very high the grids are of special deep design and the internal pipes are larger in diameter than the conventional piping to reduce head loss. The conventional valve is basically similar to the Drum Filter valve shown on the right. The bottom connection for the precoat bed formation during the precoating and polishing stages. The upper connection for the precoat bed drying during precoating and polishing stages. The one below the cake drying section is not used during the polishing stage and is turned on just to blow away the remaining precoat at the end of the polishing cycle. The valveless filter is a relatively newcomer to the range of Precoat Filters and is based on the concept that no bridge setting is required since the drum face is under constant vacuum throughout the clarification cycle. This design is much cheaper than the conventional design since the internal piping is very simple as compared to the complex internal piping on conventional filters. 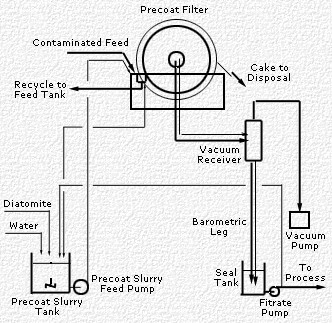 The procedure how to start the precoating stage on a conventional filter is described in detail in the section Precoating below. To start the precoating on a valveless filter it is required to build a thin layer of diatomite or perlite that will seal the drum's upper surface that is exposed to atmosphere. This will create a low vacuum on the entire drum surface and will start to formation of the precoat bed. 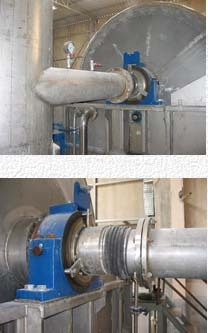 As may be seen on the picture to the right the internal piping on a valveless precoat drum runs straight from the drum face towards the center manifold that serves also as the drum's main shaft. Simple construction and easy access in case of leakages. Large diameter piping that reduces head loss mainly during the precoating stage when high rates of water flow through the piping. An agitator keeps gently the precoat slurry in suspension during precoating and reciprocates between the drum face and tank bottom at 16 CPM. The surface of the precoat bed is very dense and the degree of polishing depends on the permeability of the various grades of the diatomite or perlite . The layer of the contaminating substances that is retained on the bed surface is always very thin so special doctor blades have been developed over the years with very slow moving blades. The latest nano technologies introduced variable frequency motors that can reduce the rotation speed down to 0.4 Hz without losing torque. Such motors, generally 1 kW with VFD, when coupled with high accuracy gearboxes move the doctor blade at a speed of 1.8-18 mm/hr so the cutting edge "shaves off" a very thin layer of the contaminating substances and saves unnecessary consumption of diatomite. Once the precoat at the end of the cycle is consumed the blade retracts at a speed of 10-12 minutes and the filter is then ready for new precoating. Due to the abrasiveness of the dense diatomite precoat the cutting edge of doctor blade is divided to short segments to allow the sharpening of worn segments. The segments are generally coated with a wear resistant stellite alloy. To allow very fast drum speed that will pick up a thin layer of diatomite or perlite in the first minute of the precoating stage. Once a vacuum is created the speed can be reduced gradually to form a dense and compact precoat bed. Solutions that require a very high degree of clarity. The solids content is very low and less than 2-3%. The solids are sticky and would otherwise clog the filter cloth. The two stages are closely related since the efficient and economical performance of the filter in the polishing stage depends entirely on the selection of a suitable filter aid and the care taken during the precoating stage. A 2-5% precoat slurry is prepared by feeding the selected filter aid to a tank filled with water and equipped with a low speed mixer, such as a sweep-arm agitator, that rotates at 30-50 rpm. The low speed is necessary in order to avoid the breakage of the fine skeletal or expanded rock structure. The amount of dry diatomite in the wet cake is 310 Kg/m3 (for coarse diatomite) and 370 Kg/m3 (for fine diatomite) so, if we assume a 150 mm precoat then it may contain some 50 Kg/m2 water. Therefore, on a middle sized filter of 20 m2 the amount of water for downstream evaporation is 1 ton and this must be taken in consideration. With filtrate the transition from precoating to polishing does not necessitate the emptying of the tank whilst with water the tank must be drained in order not to dilute the solution. When the alternative to water is preferred attention must be given to the specific gravity of the filtrate since difficulty may arise while attempting to wet and mix the light filter aid in a solution of say 52% CaBr2 having a specific gravity of 1.7. In such a case the solution of using a high speed mixer is not desirable since, as mentioned above, particle breakage may occur so using an eductor to enhance wetting is a better method . When precoating commences the cake resistance is low therefore the vacuum pump should be capable to deliver a very high air flow and in some installations a separate vacuum pump is dedicated just for the precoating stage. The precoat filtrate pump should be capable of pumping the slurry at a pipe velocity of 1.5-2.0 m/sec to avoid segregation and the settling of the heavier filter aid particles. For the same reason the drum should be rotated at a high speed. The weir in the overflow box should be lowered so that the drum is barely submerged and the bed does not form too fast. A fast forming precoat is generally uneven in thickness and requires substantial "shaving" prior to feeding the contaminated solution in the polishing stage. Likewise, a precoat that forms too fast tends to crack so filtrate clarity may deteriorate and the cloth under such cracks may blind. 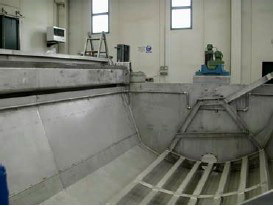 The doctor blade must be retracted to the maximum clearance between drum deck and agitator and then advanced slowly to smoothen the bed's surface in preparation for the polishing stage. Vacuum should never be cut-off during precoating (or polishing for that matter) since the heavy cake will most certainly fall off the drum into the tank with all the consequences. A rule of thumb suggests that to hold a 100 mm wet precoat to the drum a vacuum of 180-200 mmHg is required. The filter cloth acts merely as a support for the precoat that forms when precoating commences and then the already formed thin layer takes over. Therefore, the cloth should be sufficiently dense to retain the forming bed depending to a large extent on the particle distribution of the selected filter aid. The insoluble contaminants, which are often slimy and gelatinous in nature, cause fast media blinding and soon reduce filtrate rate to a trickle. Hence, the operating principle of polishing is to avoid formation of a thick layer but rather form a very thin layer that is removed continuously by shaving it off. Select a precoat material that is permeable enough to yield a high filtrate rate but dense enough to avoid the penetration of the contaminants into the precoat bed. Set the Doctor Blade to the lowest advance speed so that it barely cuts into the precoat bed since deep penetration of the insoluble matter increases diatomite consumption and shortens the polishing cycle. Diatomaceous earth or perlite are abrasive materials and the Doctor Blade's edge must be kept sharp otherwise the cut is not smooth and vibrations to the fine discharge mechanism may be experienced. A ground and polished seam of stellite is often welded along the edge to prolong the life of the blade. Good practice is to manufacture the blade from short segments since practice shows that the wear is not equal across the drum's face. Preferably, these segments should be manufactured with two sharp edges so that when one edge wears out it may be turned 180 degrees thus doubling the time required for replacement. 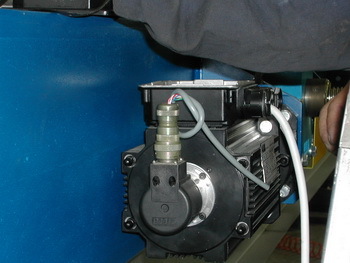 The moving parts of a rake type reciprocating agitator have many bearings that once they wear out the entire filter is subjected to shocks and shakes. This situation is dangerous since during the precoating stage the vacuum is relatively low and the forming bed may drop-off so special precautions should be taken to inspect the bearings as part of the preventive maintenance schedule.